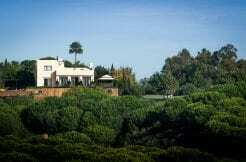 Resting in Sotogrande Costa, lies this south facing villa. It boats impeccable positioning as it moments from the Marina, beach, private beach clubs and a few minutes drive to world renowned golf clubs, which are found within this prestigious gated community. The villa itself is very modern, yet still has the classic Sotogrande Villa style. One of the most striking features this villa has to offer is its unique water feature, located at the entrance of the house. This eye-capturing courtyard entrance and water feature makes this home a one-of-a-kind villa, providing plenty of natural light and tranquility to the house. On the ground floor the house has an open-plan layout and spacious feel. The kitchen is modern and has high quality fixtures and finishes. The dining/living room has plenty of natural light and has beautiful views overlooking the impressive swimming pool and manicured gardens. There is also access to the large covered terrace, which is the ideal space to entertain family and friends. This floor also features four bedrooms (two complete with en-suite bathrooms and one with a dressing room). On the first floor is where the master bedroom can be found. This bedroom does not only boast beautiful views but also features a dressing room, en-suite bathroom, study/library and a private south facing terrace. In addition, the house also features a double garage and service quarters, complete with a double bedroom, en-suite bathroom and small lounge area.